After a sluggish start that included punting on their first six possessions, the Falcons’ offense finally got it going with a quick touchdown in the final seconds of the first half. They then carried that into the second half, scoring on five consecutive possessions. Matt Ryan overcame an errant fourth-quarter interception to lead them down the field to set up a game-winning field goal by the ageless Matt Bryant. Julio Jones finished the season on a high note with nine catches for 138 yards. It was his 10th 100-yard receiving game of the season, and he caught his eighth touchdowns of the year — his fifth in the last four games. Of all the Falcons’ defenders, there were two clear standouts. The first was Grady Jarret up front, who was able to control the Buccaneers’ interior linemen in run defense and beat them with his pass rush. Desmond Trufant was the other standout for the Falcons. Trufant had close coverage on his assignment for much of the day, and he was able to get his hands in at the catch point and break up some passes. With DeSean Jackson out of the lineup, the Buccaneers needed to look elsewhere for a secondary option alongside Mike Evans. Chris Godwin stepped up for the Bucs, making a few catches that picked up some chunk yardage. Godwin was also responsible for the Bucs’ first and last touchdown, a 30-yard catch beating Sharrod Neasman down the sideline. Jameis Winston continued his solid play for the Bucs to close the season. Winston hit some chunk plays for the Bucs, and dealt with close coverage by the Falcons in the second half and managed to put the ball in good spots. Winston’s third-quarter interception was a nice play by Desmond Trufant with a bit of a lucky bounce and was not Winston’s fault. Winston kept the ball out of danger all day and nearly led the Bucs to a season-ending win. Tampa’s defense started extremely well, really containing the Atlanta passing game. They did an excellent job of contesting catches and broke up several passes. As the game wore on, that coverage loosened and they couldn’t seem to make a big stop when needed. The Bucs’ pass rushers created a decent amount of pressure on Ryan, but they lacked the end result. They had just one sack on the day and rarely were able to get a hit on Ryan. Atlanta: Atlanta overcame a slow start on offense to score 32 points over six of their seven final possessions to etch out their seventh win of the season. 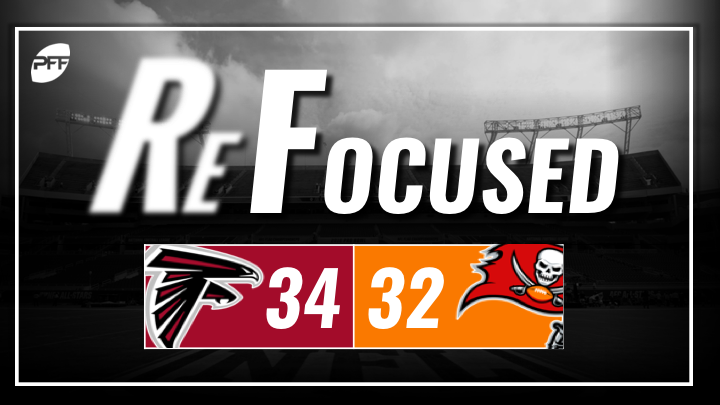 Tampa Bay: The Bucs got great contributions from Jameis Winston, Mike Evans and Chris Godwin, but the defense was unable to do enough in the second half.